Albert W. Wein, The Harvest, bronze, 1939, 36.83 x 16.51 x 31.75 cm. Photo: Boston Museum of Fine Arts. Albert W. Wein, Peter A. Juley & Son Collection, Smithsonian American Art Museum J0119848. 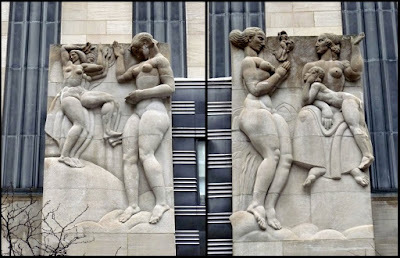 I recently wrote about t he Jewish artsit Leo Freidlander, who was leading American architectural sculptor in the interwar period, and very much part of what we now see as widespread sculptural component of the Art Deco movement. Albert W. Wein, a sculptor of the next generation, whose birthday is today, should also be remembered. His work is also steeped in the style of the 1930s. Like Friedlander, he was influenced by the popular and sometimes slick style Paul Manship. I assume Wein was Jewish - though with the exception of some California synagogue commissions in the 1960s - this does not seem to be a significant factor in his career or work. Like Friedlander, Wein was a Fellow of the American Academy in Rome, winning the Rome Prize in Sculpture in 1947. During those two years in Rome he especially turned to classical themes, though this was entirely in keeping with the tenor of the times - from the 1930s many prominent sculptors such as Paul Manship (Prometheus) and Jacques Lipschitz (Minotaur) and were using classical myths and heroes to provide narrative, eroticism, allegory and formal experimentation. 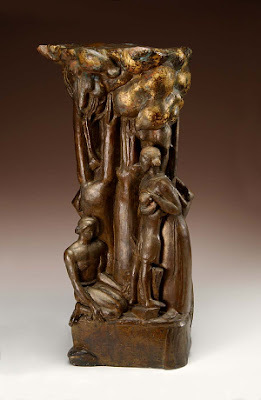 Albert Wein, Arcadian Idyll, bronze, 1948. Albert W. Wein. Europa and the Bull, bronze, 1948. Photo: Levis Fine Art. Wein's mother, Elsa Meher Wein, was a portrait painter and introduced her son to art. After moving to California in 1955, Wein carried out several commissions for the synagogues - which I am still trying to identify. 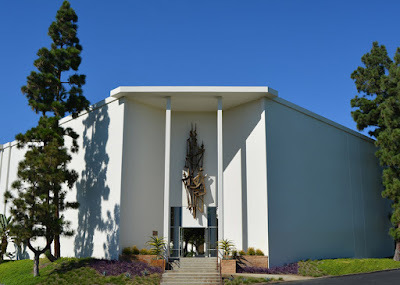 One of these commissions was in the mid-1960 for Temple Akiba in Culver City (Los Angeles), whose new building was designed by architect Robert Kennard in 1963. In 2015, when Temple Akiba underwent renovation, the 24 foot sculpture,, now called the Akiba Sculpture, was donated to Hillside Memorial Park and Mortuary: Garden of Memories in Los Angeles where it were installed along with other decorative sculpture by Wein. The largest sculpture consists of five welded bronze letters the spell the Hebrew word emunah (faith). This work comes from a period when Wein turned to abstraction - though he continued to work in a more traditional representative language as can be seen in his largest work, the relief for the Libby Dam in Montana. Albert W. Wein. 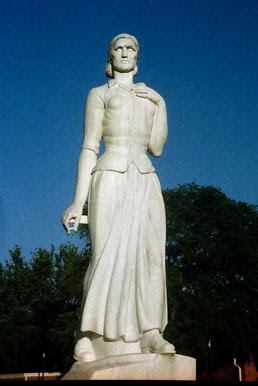 "Akiba" Sculpture (1968) re-installed at Hillside Memorial Park in 2015. Photo: Hillside Memorial Park. Albert W. Wein. Libby Dam Relief, Montana, 1970s. 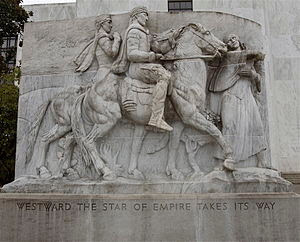 Wein sculpted the largest granite bas-relief on a structure in the United States after winning a competition for the decoration of the Libby Dam in Montana which spans the Kootenai River, and is part of a joint project of the United States and Canada. The 75-ton 27-by-30-foot relief, which recall architectural sculpture of the 1930s such as that on Rockefeller center in New York, represents, horses, salmon and an Indian taming a river, all themes grounded in the cultural iconography of the WPA. Born in New York in 1915 Albert Wein was the only son of an accomplished woman artist. This early influence had a profound effect on the creative course that the then young Wein would follow. When Albert Wein was twelve years old, Elsa Wein, a "studio" mother enrolled the two of them into the Maryland Institute, a school that adhered to a curriculum of academic based Classicism. These early influences in the classical tradition formed an impression that would last him the rest of his artistic career. In fact, Albert Wein was once quoted as saying that the main thrust of his work was "to modernize and stylize the classical tradition". The 1929 Stock Market crash put an end to his studies at the institute and caused the family to return to New York. While attending high school in the Bronx Wein registered at the National Academy of Design taking up study under the well-known painter Ivan Olinsky. By 1932, Wein enrolled in classes at the Beaux-Arts institute in New York where he expanded upon his academic education in sculpture while studying under some of the most prominent practitioners in their field. Wein's inclination toward modernization and stylistic composition in his work was made manifest when he decided to enroll in Hans Hofmann's painting class. 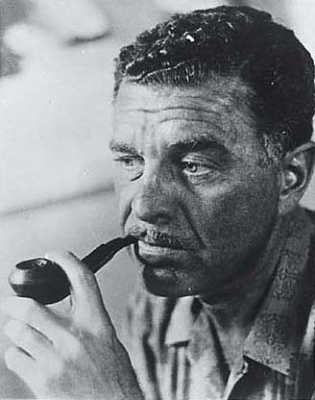 Hofmann was regarded as one of the most respected leaders in the forefront of modernism. It was around this time that Wein sculpted "Adam," an early powerful modernist work that revealed what would become his signature stylization of classical tradition. In 1934 he took a pay-cut to join the W.P.A. during which time he was able to produce many fine works for both commission and competition. Among the many honors and awards bestowed upon Albert Wein during his illustrious career included those of the coveted Prix de Rome, the highest award in art, likened to that of the Nobel Prize in literature, the Tiffany Foundation Fellowship, the Rockefeller Foundation grant for study and more. He also was included in the "watershed" exhibition American Sculpture, 1951 at the Metropolitan Museum of Art. In 1979 Wein was elected a full Academician of the National Academy of Design, the highest honor an American artist can receive. During his prodigious career he won every major prize given at exhibitions at the National Sculpture Society and the National Academy of Design. Some of his important commissions include those for the Brookgreen Gardens, (the world's largest outdoor Sculpture Garden, Steuben Glass Co., Bronx Zoo, Franklin Mint, and the "Libby Dam" bas-relief to name just a few. The latter work, Wein's Libby Dam project, was the largest granite bas-relief ever created, weighing some 75 tons and taking several years to complete. This work "has been likened by critics to other sculptures in the U.S. grand tradition such as Daniel Chester French's seated figure of Abraham Lincoln in Washington, Gutzon Borglum's Mount Rushmore, and Paul Manship's gilded bronze statue of Prometheus in Rockefeller Center Plaza". Wein's modernistic approach is also manifest in his paintings and related works. He approached painting much the same way he did sculpture, from a sound academic based foundation that gave him the legitimacy and freedom to express his modernistic views. His paintings have been widely exhibited and have gained him much notoriety, with critics lauding his ability to achieved a balance between the extremes of Classicism and Modernism. His sound foundation of academic excellence provided the basis for his stylized, modernistic approach. Wein Felt that "every good work of art is a good abstract composition" or could at least be represented by one. That the subject, devoid of details and pared down to only what is necessary to convey the "essence" of the composition is what really mattered in an artistic work. Albert Wein passed away in March of 1991. He left behind a legacy of works that express his goal of forging a union between centuries of artistic styles. Gordon Friedlander - friend and former 21st president of the National sculpture society stated eloquently: "Albert's work will live on and will endure." These sculptures have already passed the test of time - the true measure of the worth of all creative people. Riester did her undergraduate work at William and Mary and Carnegie Institute of Technology (now Carnegie Mellon University) and graduate work in ceramics at University of Pittsburgh; she received her master’s degree from Syracuse University in sculpture and design. Dorothy had many accomplishments in her long life of art, teaching, and activism. Perhaps her most lasting contribution is the creation of the Stone Quarry Hill Art Park in Cazenovia, New York, in 1991 for which she served as director and president and hen as an advisor after it was incorporated as a non-profit. In 2014 Dorothy's house and studio at Stone Quarry were placed on the National Register of Historic Places. New York, NY. Former Cong. Shaaray Tefila (now Ukrainian Cathedral), West 82nd St. Arnold Brunner, arch., 1896. Photo: Samuel D. Gruber 2017. The synagogues of architect Arnold W. Brunner (1857-1925) are increasingly well known. I have published about Brunner, as have colleagues Steven Fine and David Kaufman. But despite a few articles and passing mentions in various works, there is still much to be discovered and presented about Brunner's influential residential, institutional, synagogue, and urban design work (I've been working off and on toward that book for several years now). I'm inspired to come back now to one significant, though little known, Brunner project because I recently walked by it while visiting David Kaufman. 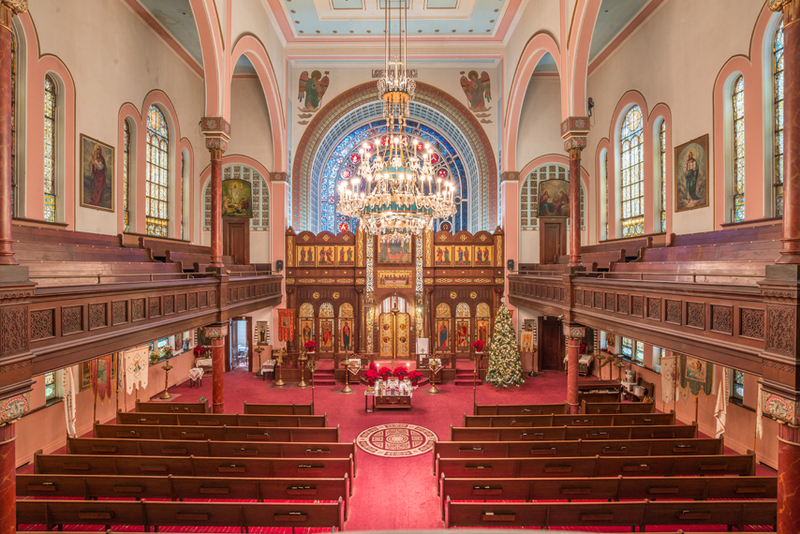 So of course the building - the former Congregation Shaaray Tefila, built in 1896, and now the Ukrainian Orthodox Cathedral - came up in conversations about New York synagogues and Jewish history. 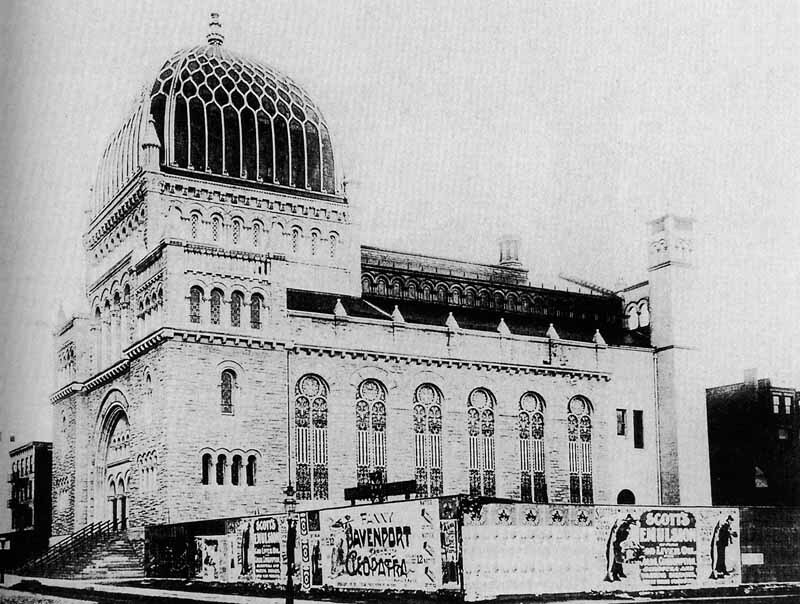 Brunner designed at least seven independent synagogues as well as several synagogues included as parts of larger complexes, especially hospitals. 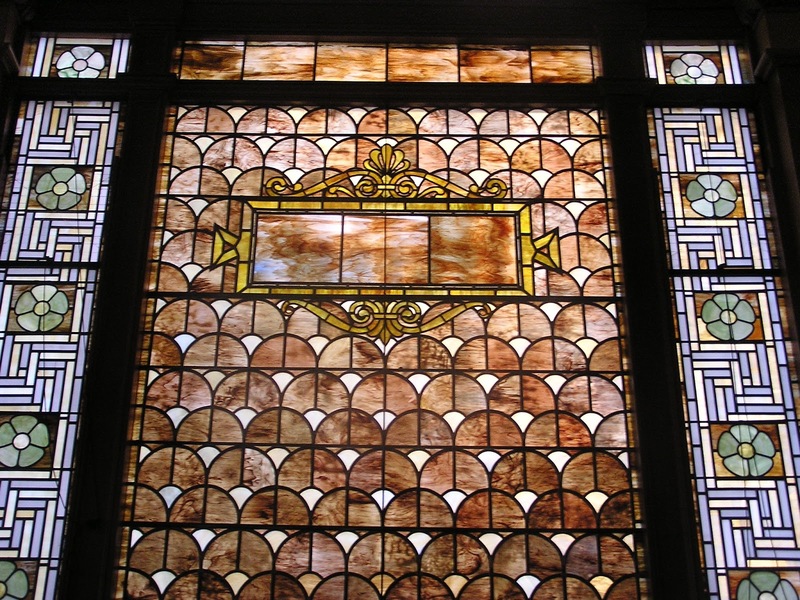 The early synagogues are each quite distinct, as Brunner incorporated elements from various sources, and was still grappling with his own idea of what a synagogue is and how a synagogue building should appear. 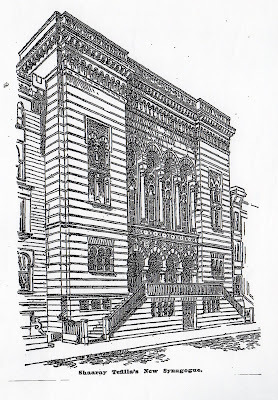 In the mid-1890s one can see Brunner moving away from the more exotic Romanesque, Venetian and Moorish influences and developing a more contemporary style rooted in Georgian or Colonial architecture, and then, with the success of congregation Shearith Israel, combining this with fully classical exteriors. By the late 1890s he settled on his preferred form and decorative palette – which he stayed with for a quarter century. This was linked to an intellectual foundation for his synagogue designs, adapting ancient architecture to contemporary needs as expressed in his writings on synagogue architecture. 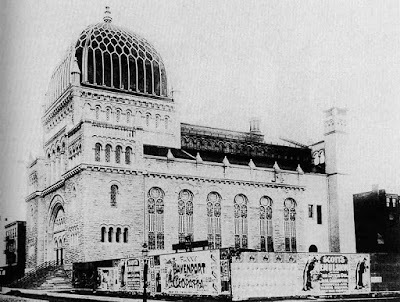 Because they were highly visible, all of Brunner’s New York synagogues were quite influential, though his own rapid development in the 1890s made his earliest work at Beth El and Shaaray Tefila almost obsolete as a source for others within a few years of their erection. Still, both synagogues were copied in part, and at least two close copies of Shaaray Tefila were built by other architects in Manhattan. 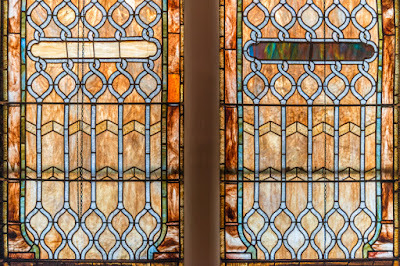 Just two year’s after the dedication of Beth-El, Brunner (and his partner Tryon) were at work on a new synagogue project – the new home of Congregation Shaaray Tefila, designated for a site at West 82nd Street and Amsterdam avenues on the Upper West Side. The cornerstone was laid on October 5, 1893. The rabbi of Beth-El, Rev. Dr. K. Kohler offered the dedicatory prayer. [see: “Synagogue Cornerstone Laid,” New York Times (Oct. 6, 1893), p. 9.]. Congregation Shaaray Tefila grew out of Congregation B’nai Jeshurun. 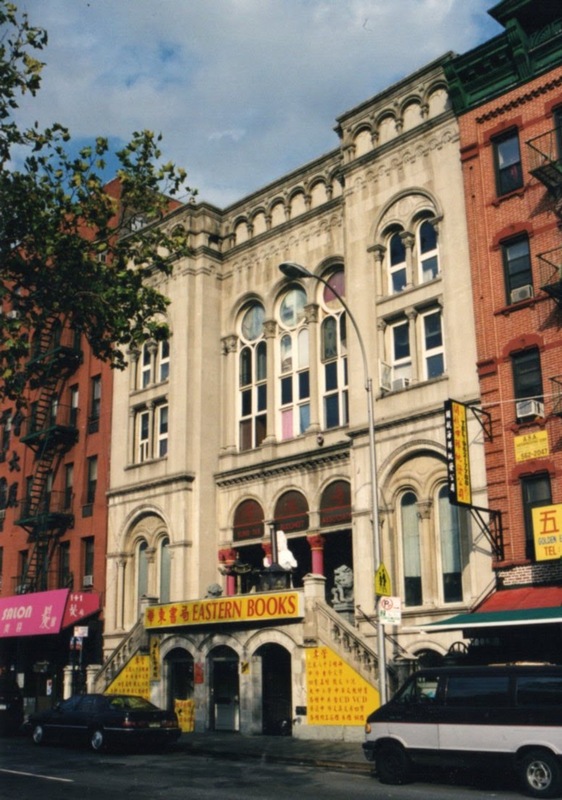 The congregation had previously worshiped at Broadway near Franklin Street, and then moved to Wooster Street, and then in 1866 they bought land on 44th street near Broadway and erected a new building designed by Henry Fernbach, that was dedicated May 4, 1869. 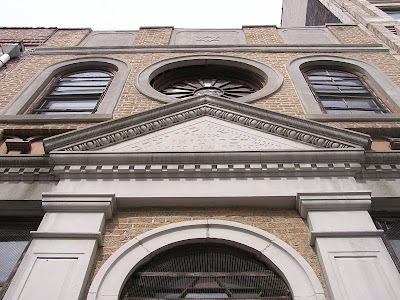 Brunner probably grew up as a member of that congregation and would have been very familiar with the earlier building, and probably celebrated his Bar mitzvah there in the fall of 1870. The building influenced his design for Beth-El. Services for Brunner’s deceased uncle Samuel Brunner (1830-1872) took place there in 1872. Samuel was the brother of William Brunner, and he was married to Brunner’s mother’s sister Sophia (1846-1922). There were even closer family reasons for Brunner’s receiving the commission. The president of the Congregation was Solomon B. Solomon (1842-1930), the younger brother of Brunner’s mother Isabella. Arnold Brunner’s grandfather, Barnett Solomon (1806-1897), past president of the congregation, had the honor of tapping the cornerstone into place. I have not consulted any records of the congregation, but some are preserved at the American Jewish Archives and I'll try to look at them when in Cincinnati in November. The form of the building façade can also be described as Venetian, for Brunner adapted the traditional Venetian palace façade for the synagogue’s public face. There were other Venetian buildings in the city at the time and the influence of John Ruskin in America was still strong. Many of New York’s Venetian buildings however, such as the Academy of Design (1862) and McKim Mead and Whites’ Herald Building (18?? ), use the Doge’s Palace as a model. 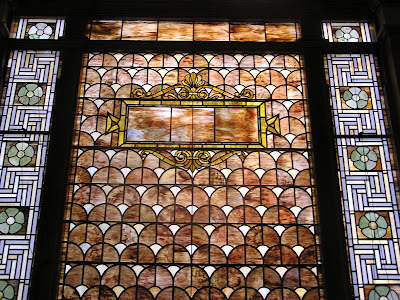 As Rachel Wischnitzer pointed out many years ago, Brunner also used Venetian elements in Temple Beth El. The general results of the Moorish movement have been unfortunate; the greatest delicacy of feeling for both form and color is needed to preserve the beauty of Moorish architecture, and curiously shaped domes and towers and misapplied horseshoe arches, turrets, and pinnacles have often resulted, presenting in many cases a grotesque appearance rather than the dignity and simplicity that should have been attained. 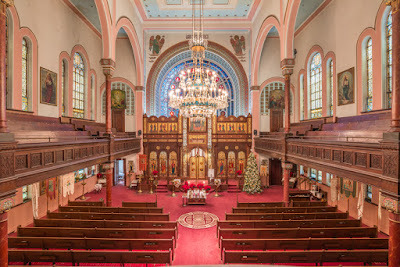 The most successful buildings in all great architectural periods are simple in design; whether large or small, richly decorated or not, simplicity is their main characteristic, and the desire to produce the picturesque and unusual is fatal to the dignity which should characterize the synagogue. 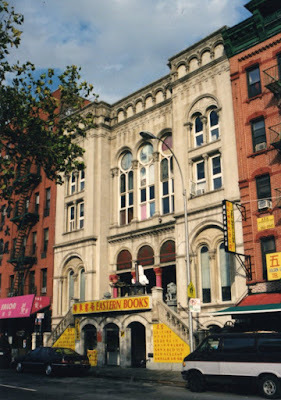 But in the early 1890s Brunner was still content to use Moorish forms - even though the building's side walls, visible only from within, employed large Georgian tri-partite window arrangements, with the center window much wider and taller than the flanking one, in the manner of Palladian windows. New York, NY. former Temple Beth El. Brunner & Tryon, archs, 1891. 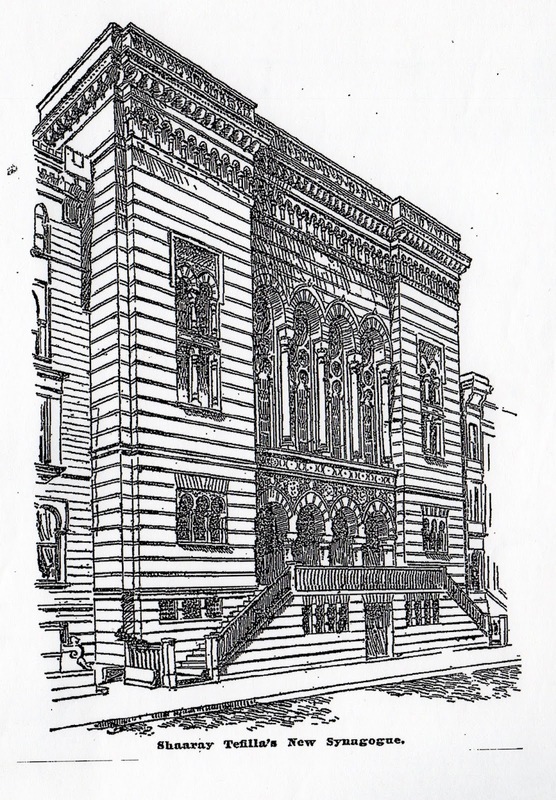 Like the Venetian palazzo, the synagogue is not free-standing, and is mostly viewed obliquely, from one end or the other of the relatively narrow West 82nd Street. Unlike Beth El, with its great dome facing Central Park, there is no distant view of Shaaray Tefila. Like Venetian palaces (and many New York row houses) Brunner placed the more important spaces high up. The main entrance is reached be ascending stairs which run parallel to the street and the façade, and terminate on a wide stoop from which one can survey the street the height, or turn and enter through a colonnade of four short columns carrying slightly pointed arches. Both stairs and stoop are lined with a fine balustrade. This type of portico, which is copied above, but with taller windows, is also a staple of Venetian palace facades. New York, NY. Kehillah Jeshurun, East 85th Street. George Pelham, arch 1902. Photo: Wikipedia (2008). 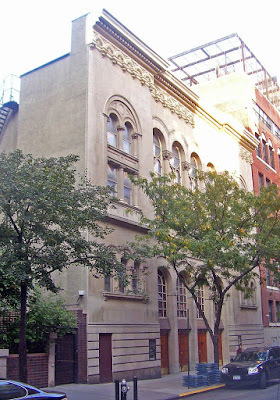 The design of Sharray Tefila was subsequently copied almost in its entirety for New York’s Kehillah Jeshurun on East 85th Street in 1902 by George Pelham (this synagogue was severely damaged by fire in 2011). The more overt Moorish or Venetian arcades have had their pointed arches transformed with sober round-arched opening. But otherwise the Pelham’s façade copies Brunner’s in all its essentials. That an Orthodox congregation should sanction the copying of the design of a Reform synagogue is remarkable, and perhaps is a testimony to the effectiveness of Brunner’s solution for a synagogue forced to build on a side street. The design was copied yet again by Congregation Sons of Kalwarie for their building on Pike Street on the Lower East Side. New York, NY. 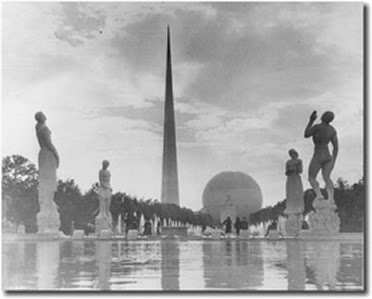 1939 World's Fair. Four Freedoms statues by Leo Friedlander. Leo Friedlander may be the least known but most visible of American Jewish sculptors He was a leader of architectural and monumental sculpture in the United States in the first half of the 20th century, and many of his works still adorn public buildings and spaces.The height of his career was in the 1930s when his figurative sculpture - free standing and in relief with recognizable but slightly distorted body types - was applied to some of the visible sites in New York, Washington, D.C. and in other major cities. 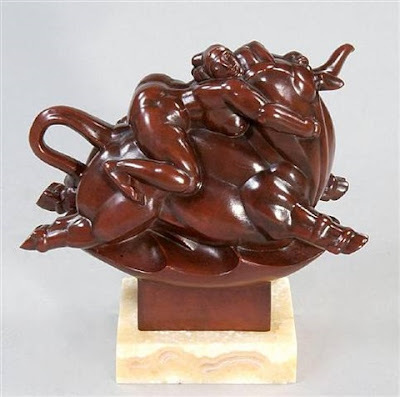 I don't think anyone today would consider Friedland a great sculptor - but he was regarded as a highly capable one, and a sculptor who was able to consistently combine his personal aesthetic with an appeal to popular taste. He combined his work straddled traditional Beaux-Arts figurative composition with Art Deco patterning and stylization. 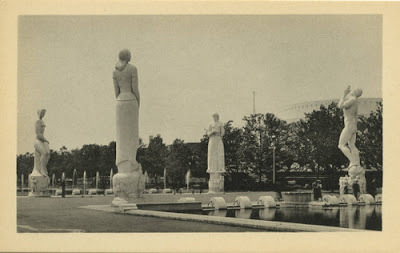 He sculpted reliefs on Rockefeller Center in New York and provided the highly visible thirty-three-foot figures representing the "Four Freedoms" (speech, press, religion, and assembly) at the central esplanade of the 1939 World's Fair. 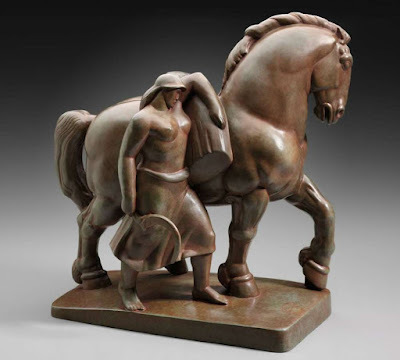 The Fair was one of the the last great moments for figurative sculpture in the United States. Following World War II abstraction quickly gained favor. Friedlander was president of the National Sculpture Society in the 1950s a position from which he railed against the newest trends. New York, NY. 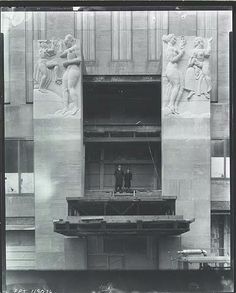 Rockefeller Center under construction with Leo Friedlander reliefs. 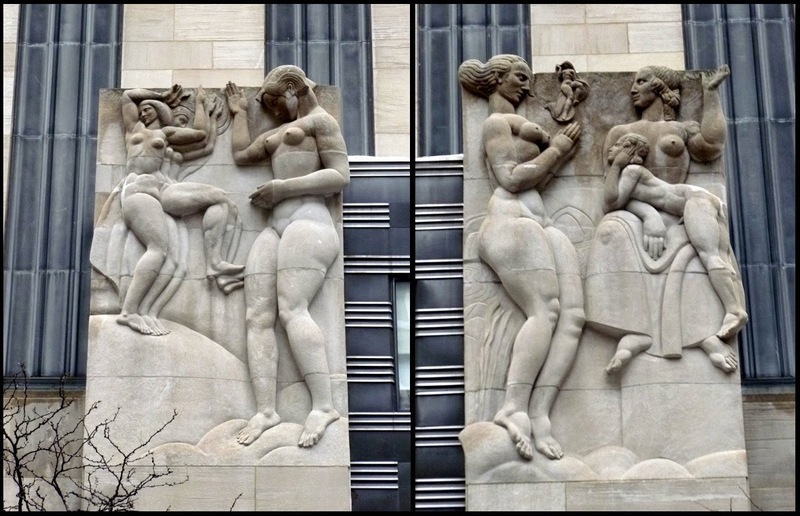 At Rockefeller Center, Friedlander supplied reliefs on several themes for the side entrances. 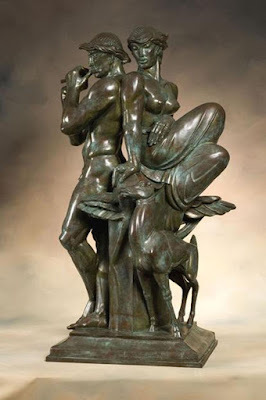 He had previously worked with architect Raymond Hood on the Social Science Building for the 1933-34 Century of Progress International Exposition, in Chicago, and had also been an assistnat earlier in his career to Paul Manship, who sculpted the central plaza figure of Prometheus. Friedlander's primary relief was at the 49th Street entrance, and was titled: Transmission Receiving an Image of Dancers and Flashing it Through the Ether by Means of Television to Reception, Symbolized by Mother Earth and her Child, Man, perhaps the first work of art addressing the new medium of television. Carol Krinsky notes in her book Rockefeller Center (Oxford, 1978, p. 144) that John D. Rockefeller did not care for Friedlander's work and that he wrote that they were "gross and beautiful." 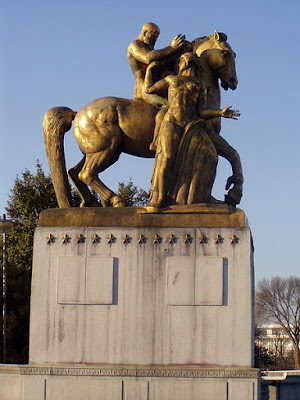 Friedlander is also well known for his colossal public monuments, including the equestrian statues for the Arts of War installation of the equestrian statues Valor and Sacrifice at Washington, D.C.'s Arlington Memorial Bridge. Washington, DC. Memorial Bridge. Arts of Wars (Sacrifice), by Leo Friedlander. Friedlander is included in Who's Who in American Jewry 1926, but I have found few other mentions of Jewish affiliation. He was born in New York David and Margarethe (King) Friedlander. He was a precocious artist and exhibited drawings at the Art Students League in New York when he was only twelve years old. He trained in Europe at the Ecole des Beaux Arts in Brussels and Paris, and then as an Fellow in Sculpture at the American Academy in Rome (Prix de Rome 1913-1916), probably the first Jewish artist so honored. 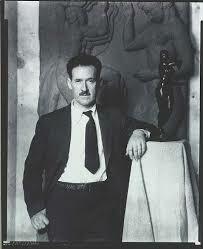 He also worked as an assistant to sculptor Paul Manship, America's leading exponent of Art Deco style sculpture. Leo Friedlander standing in front of model for relief panel for Television, Peter A. Juley & Son Collection, Smithsonian American Art Museum J0119041. Friedlander later headed the sculpture department at New York University and was also president of the National Sculpture Society. In 1936, he was elected into the National Academy of Design as an Associate member, and became a full Academician in 1949. I have not done any deep research on Friedlander, but am not aware of any specifically Jewish commissions or works of Jewish content. There is, however, a bronze sculpture Tree of Life in the collection of the Smithsonian Museum of American Art. While this theme could be Jewish, but it is a common theme non-denominational theme, too. You can see other works by Friedlander in the Smithsonian collection here. Tree of Life n.d. Leo Friedlander Born: New York, New York 1888 Died: White Plains, New York 1966 bronze 23 x 9 3/4 x 12 1/2 in. (58.4 x 24.7 x 31.9 cm) Smithsonian American Art Museum Gift of Gordon D. Friedlander 1971.151 Smithsonian American Art Museum. Friedlander was also one of many leading artists who exhibited a model at the Jewish Museum in October 1949 for the proposed Holocaust Monument planned for Riverside Park in New York City, but never built. • Reliefs for the U.S. Chamber of Commerce in Washington, D.C.
• The Arts of War sculptures, Sacrifice and Valor, flanking the Arlington Memorial Bridge in Washington, D.C.
• Sculptured Clock, House of Representatives, Capitol Building, Washington, D.C.